Freewaves is a library of art films, whose mission is also to promote youth filmmaking. I was notified today that my film “LA Woman” will be screened on April 19 at Occidental College in Eagle Rock, California, along with student work that was created for their theme of Sub/Culture. I created “LA Woman” in 2011 as an homage to the billboards, signs and murals seen throughout the city which feature various ideals of what a Los Angeles woman is. I had pondered for many months, how I would capture the compelling images I saw while driving everyday. 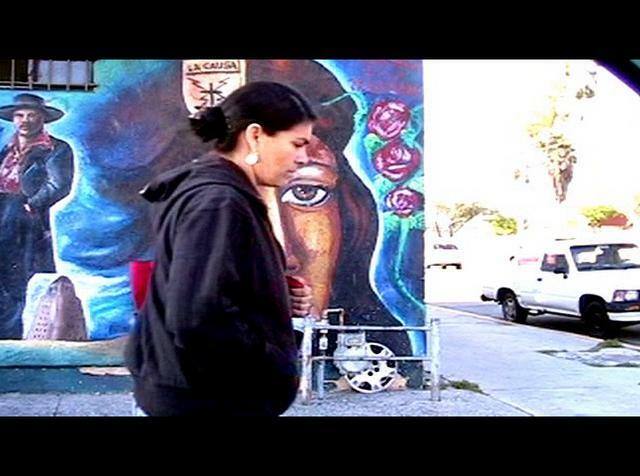 Above in the photo still of my film, I captured a young woman walking by a mural of a brown girl in a brown beret. Obviously this image was created to encourage brown-female pride. In a saint-like exclamation, the muralist painted roses by the girl’s head. I enjoy the fact that my art is paired with the works of new young filmmakers. The thought that my ideas and artistic perspective is something young people can relate to, makes me feel successful as an artist.